Rock these Girl Power buttons on all your favorite apparel including your hats and jackets. All your feelings deserve a moment in the spotlight. 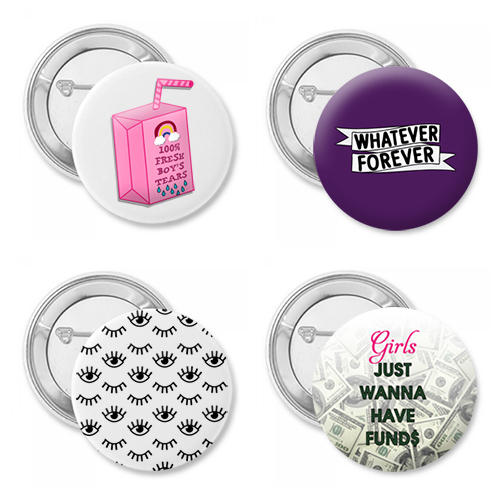 This 4 pack of Girl Power buttons feature one of each: 100% Fresh Boys Tears, Whatever Forever, Girls Just Want to Have Funds, and Flirty Eyelashes. These buttons are great to pin on all your clothes giving "wear your emotion on your sleeve" a whole new meaning. Order yours today and set the trend of coolness in your circle of friends!